April 1st was "Park Day" sponsored by the Robert E Lee Camp Sons of Confederate Veterans and the Civil War Preservation Trust which brought out history buffs, preservationist, men, women and children to help clean up Fort Germantown. 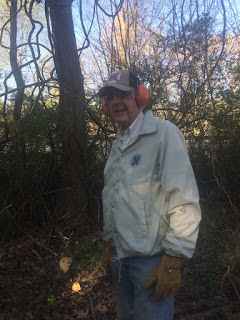 This was the third year they have worked on the Park. 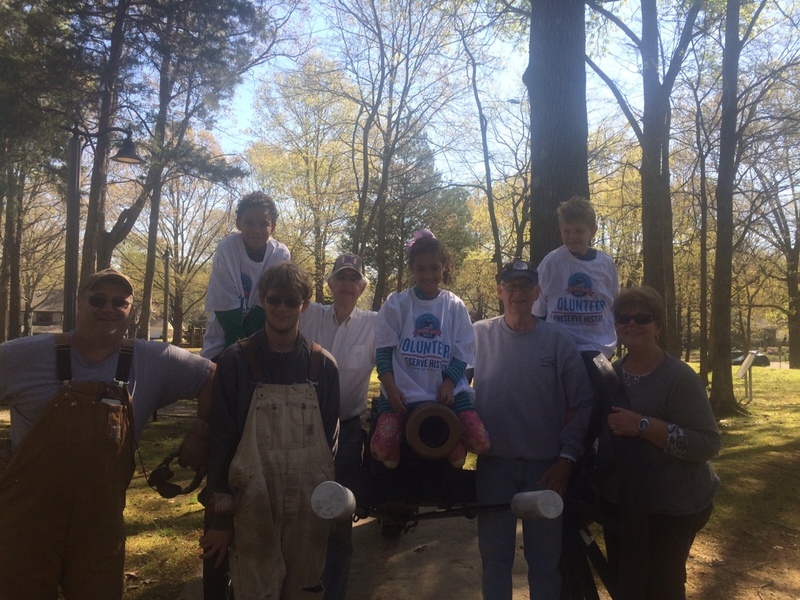 Park Day attracted volunteers of all ages and abilities bound by their dedication to serve our community at historic sites. 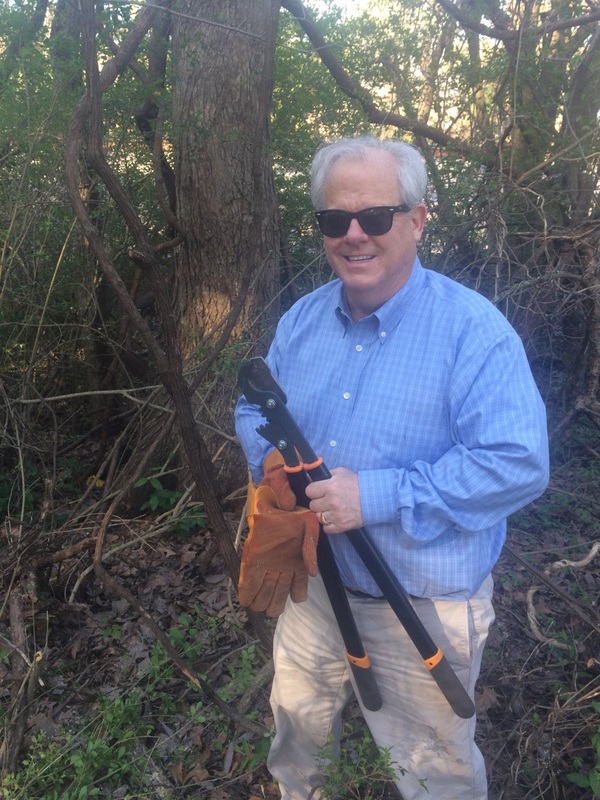 to helpcut and clear the brush. Dentist Bruce Lynch got in the act. Marilyn Ellicottgather around one of the Parks cannons. The R. E. Lee camp SCV hosted Park Day and refreshments were provided by Jody's Donuts & Bakery on Germantown Parkway. The Lee camp meets on the 2nd Monday of each month beginning at 7:00 pm at the Regional History and Genealogical building 7779 Poplar Pike. The meetings are open to the public and you are invited to the next one on May 13th. Check us out on face book or the internet Robert E Lee 1640 SCV. 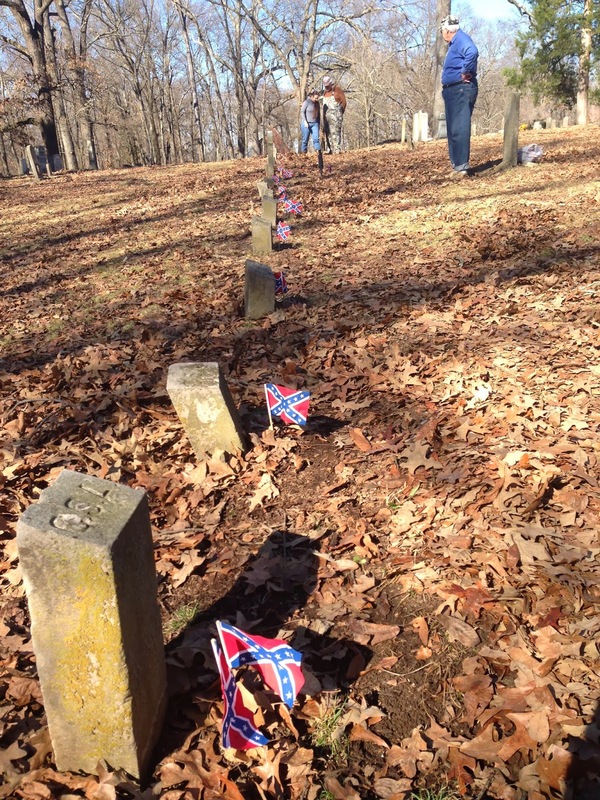 Members of the Lee Camp planted flags for 17 Unknown soldiers of Price's Brigade at Pleasant Hill Cemetery in Bartlett. There was a Southern Cross in place but it was badly placed so we re-placed it. We will hold a Memorial Service for these compatriots on May 31. 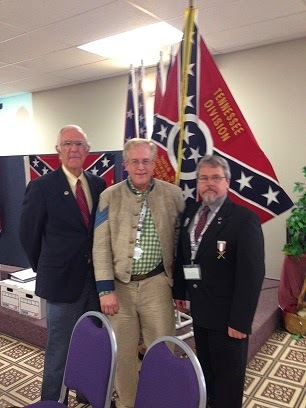 Members of the Lee Camp attended the Tennessee Division Reunion in Union City, TN on April 12 and from there to the Ft. Pillow 150th Anniversary event. Some important business taken care of and good to spend some quality time with other compatriots. It is with great pride that I announce that our Brigade Commander and former Camp Commander, Mark Buchanan, was presented with the Jefferson Davis Award at our Camp Meeting on April 14th. This is the Tennessee Division's highest individual honor, presented to a member of the Tennessee Division who has rendered outstanding service to the organization or contributed to the maintenance of our Heritage. Mark has certainly done that, many times over and on a continual basis in the last year. Well done, and well deserved, Mark. Congratulations. Jeremy Elkins of the Lee Camp produced a video in honor of Confederate Decoration Day which is nothing short of outstanding. This is posted on our Facebook page as well, but for quick and easy access I have posted it HERE as well. On May 31, 2014, the Lee Camp held a Memorial service for 17 unknown Confederate Soldiers at Pleasant Hill Cemetery in Bartlett. The photos from this event are being posted on our Flickr page and a few on the Facebook page, but this was a great, well attended event, and we hope to do this every year on the Saturday before Confederate Decoration Day. Hope to see you there next year. On 6/21/2014, the Lee Camp held a dedication ceremony for 2 12-pound Mountain Howitzer cannon that we placed in conjunction with the City of Germantown at Ft. Germantown Park, which was followed by the Memphis Brigade Dixie Day Family Picnic. Another well-attended event and a good time was had by all. More photos on our Digital Scrapbook and on Facebook. Many of our members attended Gen. Forrest's Birthday Celebration at FORREST PARK, 7/13/2014. Very hot day, but well attended event. Good speaker, great fellowship, nice breeze in the shade.